"In the words of this beautiful canticle, Saint Francis of Assisi reminds us that our common home is like a sister with whom we share our life and a beautiful mother who opens her arms to embrace us. “Praise be to you, my Lord, through our Sister, Mother Earth, who sustains and governs us, and who produces various fruit with coloured flowers and herbs”. As a science teacher with a degree in biology I have had an awareness throughout my young adult life of the need for all humans on Earth to take a vital role in helping in preserving our Planet. 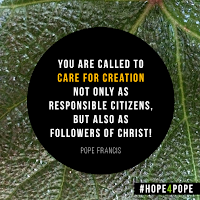 I was excited beyond words when Pope Francis released his encyclical, On Care for Our Common Home (Laudato Si). No one can deny that when it comes to environmental issues that require our attention now, science and our faith have reached common ground. 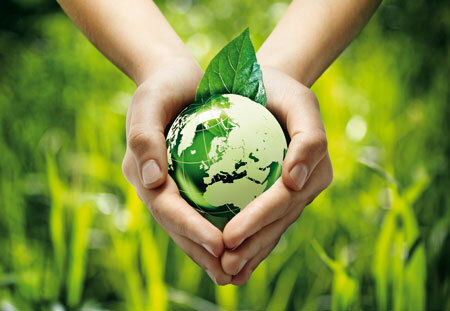 As inhabitants of the Earth it is our responsibility to work together to face environmental challenges together and to take action towards positively shaping the future of our Planet. Fossil fuels, such as gas and oil, are non-renewable resources, which means that eventually these materials will run out, which is not even the major issue. The issue that we need to be concerned with is that the burning of fossil fuels causes an increase in carbon dioxide into the atmosphere. What does an increase of carbon dioxide in the air mean for us? Increased levels of carbon dioxide in the atmosphere means that there is increased levels of greenhouse gases. Greenhouse gases at normal levels help to warm the Earth, but when greenhouse gas levels rise to higher levels the greenhouse gas effect takes place, which ultimately results in global warming...okay science overload. The point that we have to get across here is that increased temperatures on earth cause a rise in sea levels, which wreaks havoc on our coastal lands causing severe erosion, the flooding of wetlands, the contamination of aquifer and agricultural soil, and a loss of habitat for wildlife. I recently learned of the religious sisters in Pennsylvania who have taken a stand against a company attempting to build a pipeline on their land. I admire and commend these religious sisters for fighting on behalf of our religious beliefs and arguing for the preservation of the 'sacredness of the land'. The Pope has called all people to take part in caring for creation, and so it should be no surprise that a congregation of women religious are on the front lines in this battle in support of the environment. A natural gas pipeline through the land of these sisters means more natural gas, and more natural gas means more burning of of fossil fuels, and....I think you get the picture. 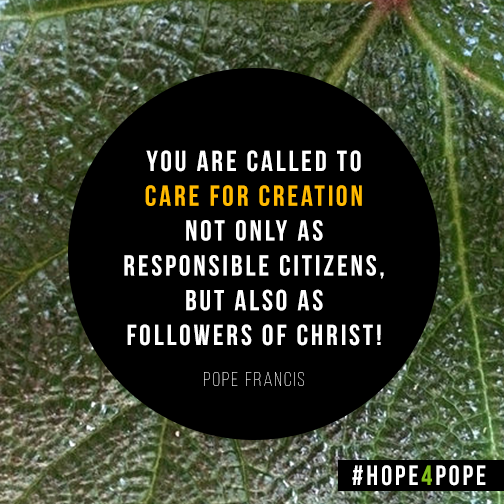 We are called, especially as Catholic women and men, to be stewards of the Earth, and to take care of all of God's creation. Let us promote an awareness for environmental concerns and just as these religious sisters, take a stand for our faith with love and humility. I'll be sharing this! Thank you!